Cream butter, brown sugar and sugar together until fluffy, about 2 minutes. Add in the eggs and vanilla, mix well. Add flour, baking soda, and salt, mix until combined. Fold in the chocolate chips. Scoop tablespoon sized balls of dough onto a lined baking sheet. Bake for about 10 minutes. Allow to cook on the baking sheet for a few minutes before removing to a wire rack to cool completely. While cooling you can make the filling. Beat the butter and brown sugar together over medium speed until fluffy, 2-3 minutes. Add flour, powdered sugar, and salt. Mix on low until fully incorporated. Slowly add the heavy cream and vanilla. Beat for about 2 minutes, until fluffy. Stir in chocolate chips. 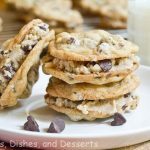 Once the cookies are completely cool sandwich 1 rounded tablespoon of filling between 2 cookies. Gently press together until the filling spreads to the edges. Store in an airtight container in the fridge. Let them set at room temperature for a few minutes before serving.